How is it possible that the richest 1% owned more wealth than the rest of the human race? Perhaps they are all entrepreneurs in their respective endeavours. If they are entrepreneurs, are the rest of the world onlookers? Certainly not. Then what truly sets these individuals apart from the rest of the world? Like you, I was quite puzzled by the scenario where a few occupy the top position in the world income distribution. Not for long though. I discovered that successful people understand how to prepare for great opportunities. I love track and field events. The likes of Usain Bolts have recently made it more exhilarating to watch. However, the story of Usain Bolt resonates with my earlier statement that successful people are prepared entrepreneurs. Usain Bolt has always shown interest in the race track event and work hard to become a 200m champion. He did win the 2007 World Junior Championships held in Kingston. Yet, no one thought he would win the 100m race much more become the world record holder. Usain bolt is about 6’5 frame which was expected to be a hindrance in the track event but he turned it into an explosive power through hardwork. In fact, Usain Bolt trained his body to overcome the present limitation and seized the opportunity to become the fastest man alive. Let’s pause a bit. Usain was preparing to become a 200m expert and in the process, he saw the opportunity to be the fastest man in the world. How would he have discovered this if he was not applying himself? Opportunities are all around us but we can only access them in our prep room. It is fair to say that the richest 1% are entrepreneurs who can see through the lens of time, the need, and aspiration of the human race. Their achievements did not happen by chance. They all laboured as you have strenuously pushed to be here in this world. Opportunity is created daily and it’s all around us. Yet, only a few are able to seize it and turn it into a blessing. Mark Zuckerberg saw the need for social interaction and created Facebook. The likes of Amazon and Ebay jumped on the need for online retail outlets and today they are successful. The early men saw the need for light and they endlessly sought to create fire. Truly, opportunity is the daily creation of the human race and it’s wrapped up in our needs and value system. 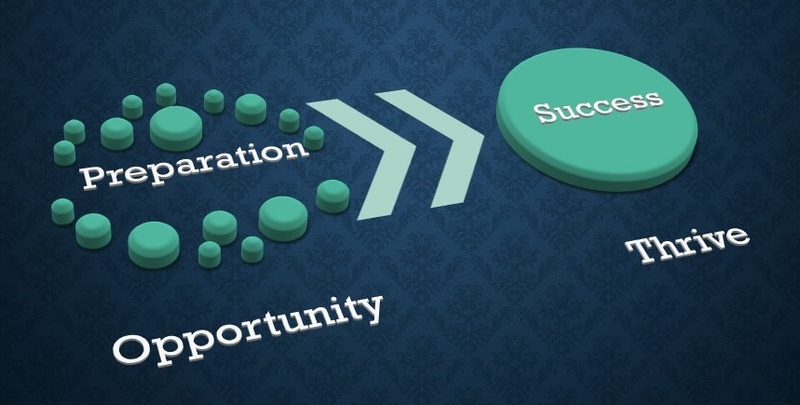 However, seizing these opportunities is what creates the defining moment for winners to emerge. They say success is born when preparation meets opportunity. The success we all seek is here right now. It’s disguised routinely as an opportunity but how prepared are you to seize it. Preparation is the variable that must be earned and horned to become and remain a winner in any sphere of life. After all, there are more than a billion of us, a pool of opportunities waiting to happen but I choose to seize mine. Let’s pause and listen to the two great minds of our time, Warren Buffett, and Bill Gates. During a question and answer session at Columbia Business School, Bill Gates made emphasis on two outstanding opportunities of our time-artificial intelligence (A.I) and clean energy. These are two exciting lifetime career and if he had to start all over again he would focus on these two. Warren Buffett believes that greater opportunities are seized when we look for the job that we would take if we didn’t need a job. He would become an investor if he had to start all over again. One thing is peculiar with these two great minds, seizing an opportunity and investing the resource required to attain noticeable achievements. What bothers me most is not the numerous opportunities that are created daily but the few prepared minds. You see, opportunity is a present occurrence while preparation is how you spent your time in the past. Whilst there are many opportunities today there are fewer people ready to seize it. My question to you is what are you doing right now? Bill gates started Microsoft in 1970, launched Windows in 1985, took the company public in 1986 and by 1999 his wealth was over 100 billion. In all of this, I see opportunity presenting itself to Bill Gates and each of them were met with a prepared mind. Preparation for Bill Gates was a daily action. Preparation is a seed that should be sown on a daily basis. It may take time and pain but the reward is sure. The question right now is what are you preparing for? If you are in preparation mode, you will see the right opportunity to seize. Think of preparation as a mustard seed. When you plant the seed, it takes few years to become a tree. A tree in itself is an embodiment of purpose that seizes the opportunity to provide shelter for birds and people. Actually, opportunities are only identified in the place of preparation. When you apply yourself to developing your craft through knowledge and skill acquisition, you gradually begin to notice the void around your craft. A desire to fill that void grows until you seize that opportunity. I hail from a country with one of the largest crude oil reserve in the world. Prior to when this commodity became a worldwide necessity, no one saw this product as a wheel of change to global energy. In fact, in the 19th century, even though ancient societies have used petroleum seeps since the prehistoric times, the commodity was never traded. The commercial discovery of oil was coincidental with the search for salt brine. It turns out that during the search for salt water, some of the drillers struck oil but they considered it as a nuisance. I am quite sure you are wondering how naive these people were. This brings me back to my earlier point that preparation allows you to see opportunities. In some cases, the opportunity might redirect your plan as in the case of oil instead of salt brine. If your level of preparation is shallow you are likely not to see the oil. These folks were all after salt and they missed what would be one of the highest commodity exchange in the future. However, in 1859, Colonel Edwin Drake thought about the commercial benefit of the petroleum seep in large volume and decided to set one goal, to produce crude oil in commercial quantity. Drake embarked on this quest. He was laughed at, ridiculed and ran into debt. In 1859, same day Drake received a letter stating that all his financial backers were pulling out, he struck oil. The excavation produced 20 barrels of oil per day. Drake met that opportunity with adequate preparation. Are you prepared for your opportunity? Michael is an Entrepreneur, Educator, Writer and Researcher. He loves to communicate with people via write-ups and promote his ideas using media outlets. He loves to share his thoughts on product, personal, business, lifestyle and career development.